and more as applicable by product, may be found at www.csimn.com. 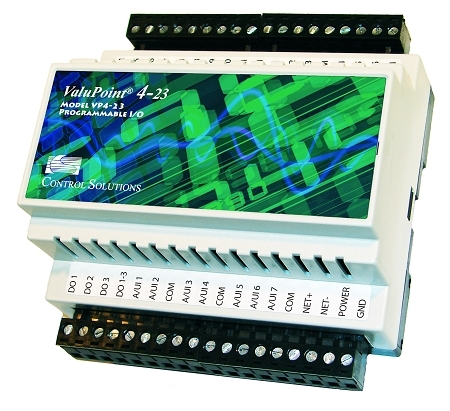 ValuPoint Model VP4-2330 Programmable I/O for BACnet MS/TP is a BACnet Application Specific Controller (B-ASC) that includes user programmable control, 14 analog/universal inputs, 3 analog outputs, and 6 relay outputs. VP4-2330 also includes a BACnet client for interface with other MS/TP devices. Control Solutions Model VP4-2330 ValuPoint Programmable I/O for BACnet MS/TP is a BACnet Application Specific Controller (B-ASC) that includes programmable control. The 4th generation ValuPoint platform is designed to be a building block in a distributed control system where controllers communicate peer to peer via BACnet MS/TP. The ValuPoint Model VP4-2330 features 14 universal context sensitive inputs. When configured as an analog input, the continuously self-calibrating sigma-delta converter produces 15-bit resolution with high noise immunity. When configured as a discrete input, the converter switches to 10-bit resolution at 1,000 samples per second for fast response. Copyright Control Solutions, Inc.. All Rights Reserved. eCommerce Software by 3dcart.